First Place Gross was won by the Rutland Redevelopment Authority team at the 2014 Chamber Golf Classic Fundraiser. 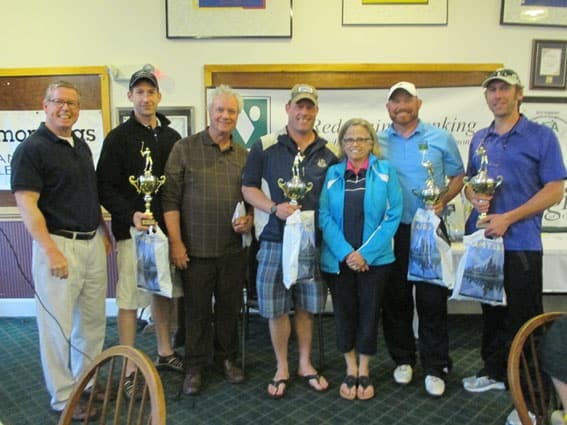 KILLINGTON — The Rutland Region Chamber of Commerce 30th Annual Golf Classic Fundraiser is scheduled for Friday, May 29 at Green Mountain National Golf Course in Killington. The day will include a shotgun start at 1:30 p.m. with a fun day of golf, great goody bags, a chance to win a car from Shearer Honda and a hot tub from Allen Pools & Spas on two designated holes-in-one, awards dinner featuring special guest Master of Ceremonies Jack Healey of Northeast Sports Network and WSYB 1380am, and much more. The tournament format is Captain and Crew with teams of four players. The cost is $99 per person and includes greens fees, cart rental, awards dinner, goody bags, a chance to win great door prizes, team prizes, trophies and a silent auction. This is a great networking opportunity and an important Chamber fundraiser. Sign up your team now by filling out the form online at RutlandVermont.com, emailing chamber@rutlandvermont.com or by calling 802-773-2747.